If you install FDM Enterprise edition, ODI is automatically installed. MSI client installers for EPM Architect, Strategic Finance, Interactive Reporting, and SQR Production Reporting. There is a Port manager in the config tool that manager port uniqueness and detects if a port is already in use. Documentation available in MOBI and EPUB formats. 9.3.x and lower apply maintenance patch 9.3.3, then Lift-and-shift upgrade to 11.1.2.2 and then apply 11.1.2.3 maintenance release. Finally we get a log analysis tool that will simplify looking at logs. We no longer have to hunt and scour the filesystem to locate logs. This tool list errors from the entire EPM system by time, by functional issues, etc. You can also trace the activities of a user session across all EPM system component by tracing a Execution Context ID (ECID) which is a unique identifier. 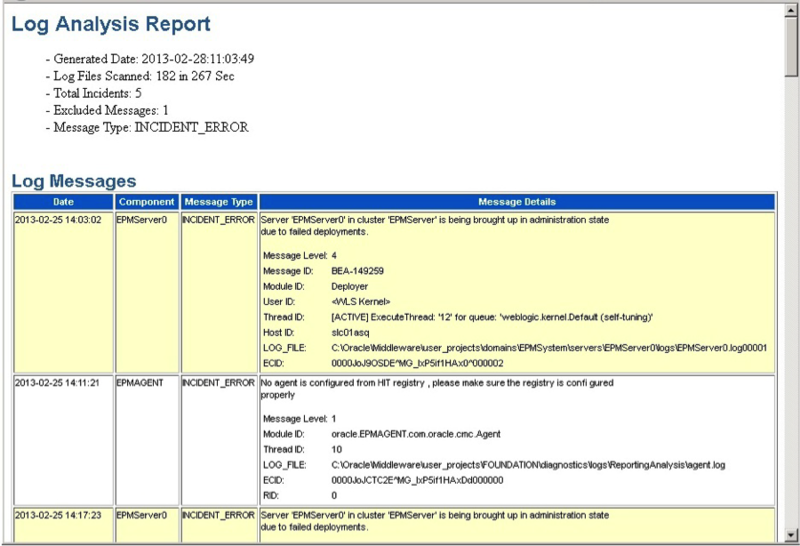 The Log analysis tool creates an HTML format based report with a time stamped filename. ~ by Eric Helmer on April 29, 2013.